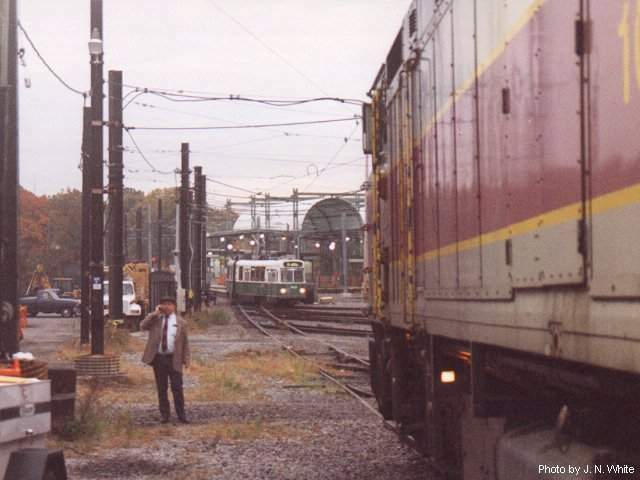 This photo of the first commuter train to Riverside in nearly 50 years, shows an F40PH-2c locomotive and a Green Line Type 7 LRV on the same trackage, separated by only a couple hundred feet. The gentleman in the foreground is Amtrak Transportation Superintendent W. C. Laxton. Photographed by Jonathan N. White, October 23, 1996. Added to the photo archive by Jonathan White, November 19, 2000.